A must have for using Airbrush makeup Airbrush Cleaning Fluid should be used after each use. Available in a 2 oz. or an 8 oz. bottle. 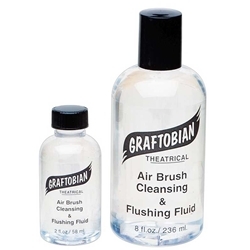 The Airbrush Cleansing Fluid makes it easier to clean bottles, tubes, cups, and airbrushes. Please note that the cleansing fluid it not to be used as a thinning agent.